USAC issued Wave 13 for FY 2018 on Friday, July 6th. Cumulative funding as of Wave 13 is $1.32 billion. 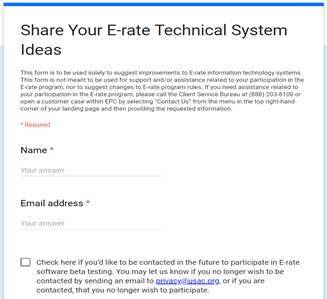 USAC’s latest News Brief (referenced below) encourages E-rate participants to submit their ideas and feedback on Schools and Libraries information systems via the USAC web page “Share Your E-rate Technical System Ideas.” The site can also be used to volunteer to help test new IT features. July 23 Deadline for submitting Form 470/471 comments (see Federal Register notice). Last week was the deadline for submitting reply comments on the FCC’s Notice of Proposed Rulemaking (“NPRM”) on Protecting Against National Security Threats to the Communications Supply Chain Through FCC Programs (see FCC 18-42 and our newsletter of April 2nd). Initial comments filed by the State E-Rate Coordinators’ Alliance (“SECA”) and the American Library Association (“ALA”) both urged the FCC to base compliance with any resulting E-rate rules on service provider assurances and certifications.. Additional support for this position was provided in the reply comments filed by Kellogg & Sovereign Consulting (“KSLLC”). 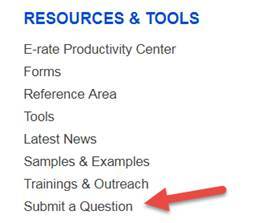 USAC’s Schools and Libraries News Brief of July 3, 2018, indicates that the much beloved “Submit a Question” feature, long a staple of the “Resources & Tools” list on USAC’s E-rate site will be retired as of Friday, July 13th. For “Submit a Question” cases pending as of June 1st, USAC is creating new customer service case numbers, linked through EPC.